Lenovo N21 Chromebook is designed with reliability, ruggedness and ease of use in mind. Reinforced ports and hinges, anti-peel keys and a sealed touchpad make the Lenovo N21 Chromebook durable while the rotatable camera, retractable handle and 9.5 hours of battery life make it excellent for the education environment. *Drops are not covered under the product warranty, but you can purchase Protection sur les dommages accidentels to protect against such accidents. 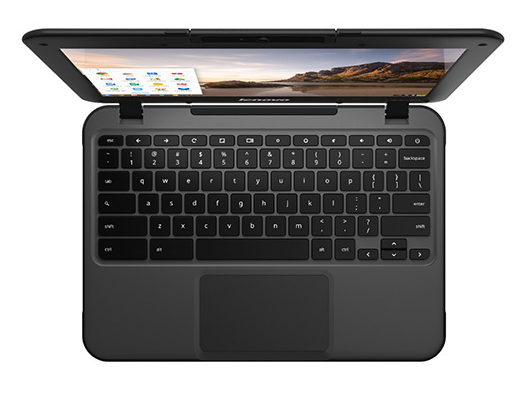 Chromebooks are easy to use, with no setup required. Access the internet through Wi-Fi or LAN connection to get started. Simply log into your Google account to use these great products from the cloud: Google, Gmail, Maps and Docs and pics. Chromebook also has up-to-date virus protection built-in, and keep going with a long-life battery!